I have been using this little player on and off over the last few weeks and so I thought it is time to give it a review. 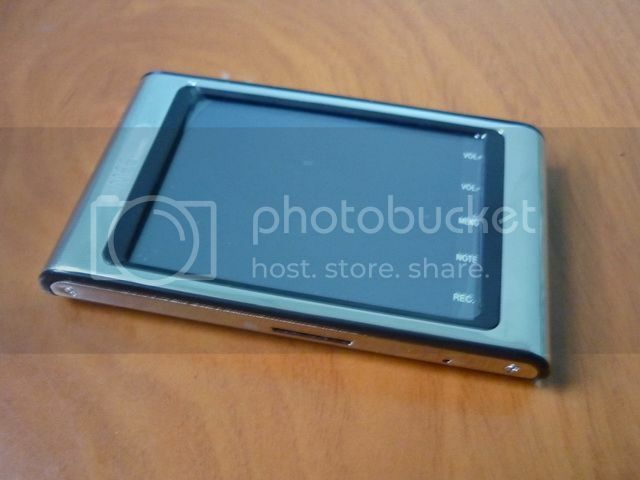 Screen: 320x240 262K color 2.6 inches touch screen TFT. On the right side of the touch screen: Vol+, Vol-, Menu, Note(scratch pad), , Rec. microSD slot and mic/reset are on the bottom. Headphone jack and USB slot on the side, ON/OFF (with hold) on the top. Most of the outer case seems to be nickel plated steel, which gives the player a bit more weight than your typical mp3 player. All the marking and icons are either lasered on or engraved. The housing is very classy actually though it is a fingerprints magnet. 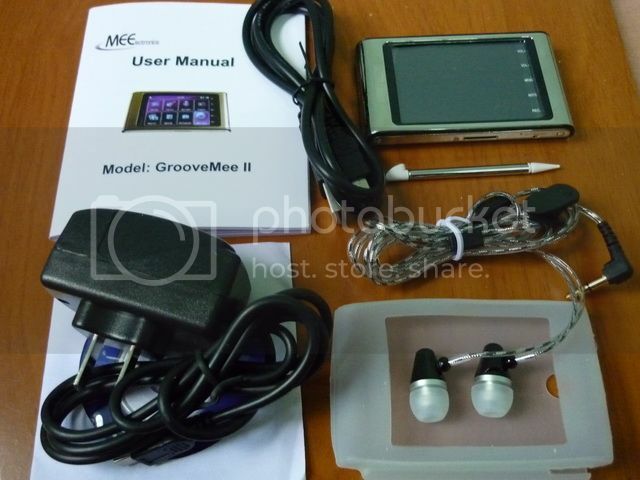 Inside the box, you will find the GrooveMEE II, USB power adapter, USB cable, pen for touch screen, MEElectrnoics' own IEM the M2 (with three set of eartips), silicone case, small CD with a simple video converting software inside, user manual. 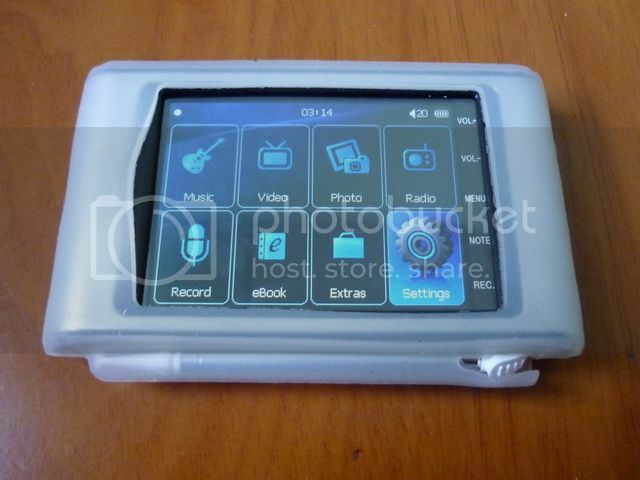 Pretty everything you will need for a mp3/mp4 player are included, which is of course great. Overall the build quality is pretty good. 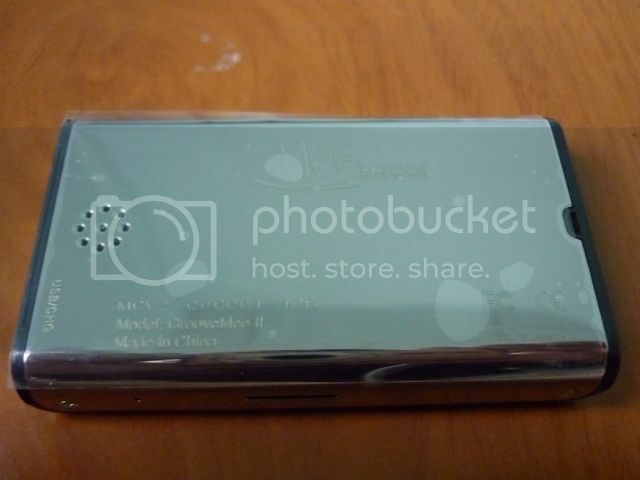 The metal housing does have more weight to it, but not something too heavy to carry around. The included earphone is MEElec's own M2 with the new cable, which is definitely a step up from typical stock earbud you will get from most brand name mp3 player. Unlike most other DAP, with GrooveMEE II you get almost everything you'll need instead of spending more money trying to get things like silicones case or a decent quality IEM. The included pen is a nice touch. While the player itself doesn't have extra space to hold the pen, there is a side compartment in the silicone case reserved for it. The G-sensor actually works okay. You can use do Next/Previous by shaking the player to the right/left direction but it isn't too sensitive to randomly skip song. If there is one thing that I want to complain about, it will be the viewing angle of the screen. Basically you will need stay in front of the screen to get 100%. While you can still see at an angle, the reflection becomes more of a problem. This is likely an issue when you want to share your video together with someone else. There is one physical switch on the player and it is the ON/OFF with hold key. To turn the player on, you'll need to push the ON/OFF switch to aside for a good 5 seconds. Push it to the other side and you will lock the touch screen down. Most of the navigation is done via the touch screen. Basically there are 8 selections on the main menu: Music, video, photo, radio, record, eBook, extra, and setting. You will find the file manager, a calender, stopwatch and the scratch pad inside 'extra'. You can also change the color of the most of the font and the menu transition style inside the setting. In music playback, you can either use the folder browser to play music inside a folder, or choose from ID3tag based categories such as 'artist' or 'album' (it is a bit slow this way as the player read the whole library). Generally the player acts more 'old school' (no necessary a bad thing) and works much like a MSC device. I do hope the browser can be a bit more straight forward (especially on the naming on different folder and submenu) as something it can get a little confusing. During music playback, you can choose whether to display the ID3tag info, lyric, album art or active equalizer. 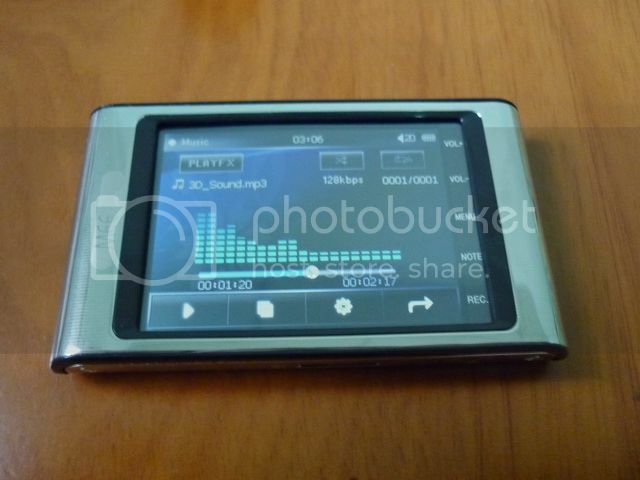 Since the player use kind of a file browser to navigate and select music, you will get both the internal memory and the microSD as two separate folder instead of a tightly integrated music library. Video playback is much simpler to use. Just browse and select the file you want to play. Unfortunately it doesn't remember the last position so you will need to start from the beginning every time. While there is a pen included for navigation, using finger is just as easy - but I do recommend you use a screen protector sticker so you won't scratch the screen in the long run. On a side note, the scratch pad (or 'note' function) is quite fun to use and function like 'Paint' in Wondows, but not precise enough for really create a drawing. 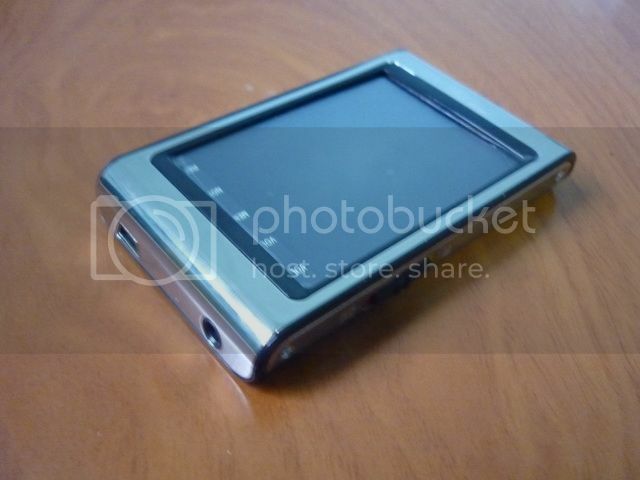 I mainly compare GrooveMEE II to my Sansa Fuze and Nano4 for its SQ. GrooveMEE II has a colder, brighter sound signature that slightly lack in warm, much like Nano4. However, the overall SQ is pretty decent. In comparison, I think its headphone-out on flat EQ can at least match, or even better than Nano4, while not as good as Fuze. On the other hand, GrooveMEE II has much better and more enjoyable EQ than both Fuze and Nano4. Another plus is it also supports the more common lossless codec such as FLAC and APE. I didn't test any lossless as my music library consist mainly of high quality mp3 or wma. 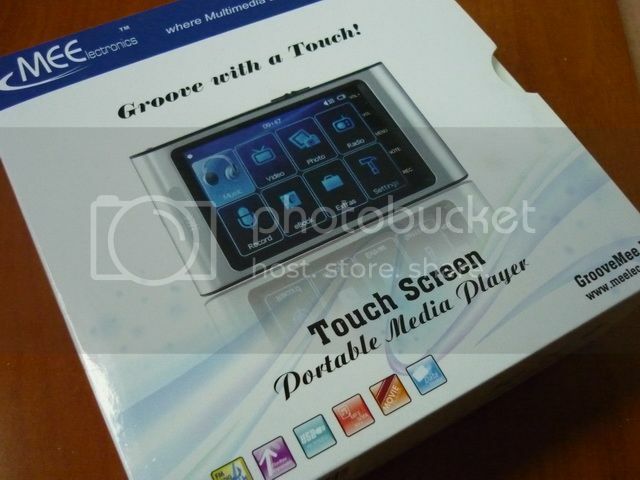 What surprised me at first about the GrooveMEE II is its video support. For testing, I put a DVD resolution RMVB movie into the player (w/o any conversion!) expecting to crash it (or at least make it quits) but instead it plays it rather smoothly without much pixelation. This put both Fuze and Nano4 to shame. GrooveMEE II does come with a simply video converting software for those oddly encoded video, but so far I don't find any need to install it. For Photo, I have tested a 3MP pictures without problem. It will auto zoom the picture to fit the screen, but it also allow a fixed 2X(?) zoom but it won't do full size. It is a decent picture viewer overall. Overall, I find GrooveMEE II to be a decent all around player for the money ($70 for the 4GB models and $90 for the 8GB). It does everything well but nothing very outstanding. Versatility is perhaps its strength in the three MEElectronics' PMPs line-up (MEElec also has the smaller MiniMEE II purely for music and portability and the larger RockMEE II oriented toward video playback). 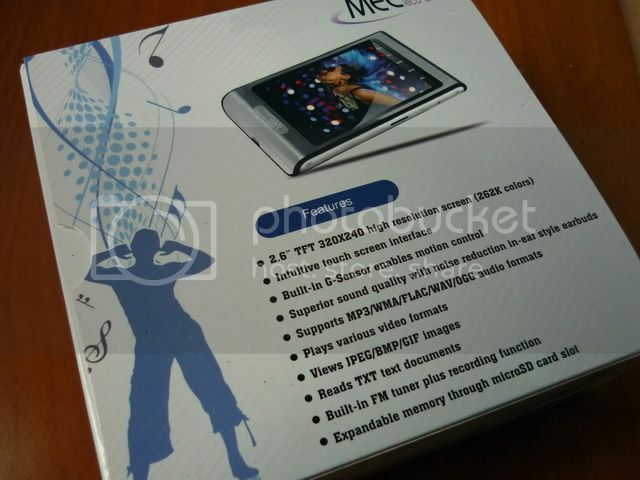 Strength enough RockMEE II also priced the same as the GrooveMEE II. It does has a bigger 3 inches 16:9 screen but lacks in touch screen or G-sensor. Personally, I will still pick my Fuze for purely music playback (plus I already have custom LOD built for it), but if you are looking for a decent PMP that does everything well which isn't too complicated to use, this one is worth a consideration.